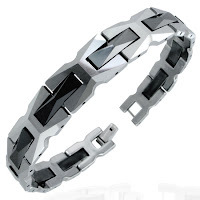 Well we have just had a brill selection of Tungsten Bracelets for men in come into stock. Tungsten is a excellent metal for use in jewellery as its so dam tough! It has a highly polished mirror finish thats really hard to scratch in fact only a diamond can be used to cut it! These bracelets look outstanding when they are on and will last forever! I wear a tungsten ring, never take it off and there is hardly a scratch on it! Honest no lies here, check out this beauty………….